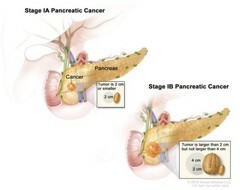 Stage I pancreatic cancer; drawing on the left shows stage IA pancreatic cancer. The cancer is in the pancreas and the tumor is 2 centimeters or smaller. An inset shows 2 centimeters is about the size of a peanut. The drawing on the right shows stage IB pancreatic cancer. The cancer is in the pancreas and the tumor is larger than 2 centimeters but not larger than 4 centimeters. An inset shows 2 centimeters is about the size of a peanut and 4 centimeters is about the size of a walnut.